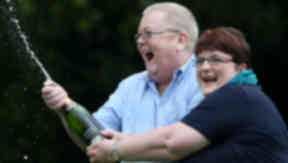 Chris and Colin Weir, from Largs, Ayrshire, are the UK's biggest ever lottery winners. A Scots couple who won £161m on the lottery - the UK's biggest ever win - have announced their intention "to divorce amicably". Chris and Colin Weir, who scooped the EuroMillions prize in 2011, also confirmed they had been living apart "for some time". A statement said: "It is with deep regret that Chris and Colin confirm they have been living apart for some time and intend to divorce amicably." Colin, 71, a former TV cameraman, and Chris, 62, a former psychiatric nurse, made the Sunday Times Rich List with their win eight years ago. They also made a donation of £1m to the independence campaign ahead of the 2014 referendum, and continued donating to the SNP afterwards.